Magui is a wrapper that calls functions from the Python library of Citellus README.md. Magui aims to use Citellus for gathering the data and later, write plugins to analyze that information. Plugins use uuid to identify plugin properly and act on them. Autogrouping: based on metadata plugin, runs comparisons against sets of host roles, hostnames, etc for better spotting issues across systems. Remember that pypi package might not contain all the latests plugins features as the github repo one. 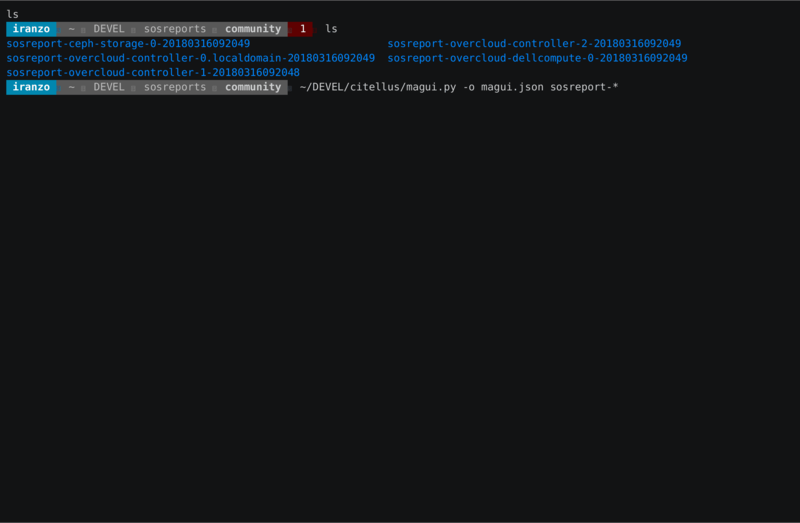 docker run --user=$(id -u) --rm -v $PATHTOSOSREPORT:/data:Z citellus/citellus:latest /data --entrypoint="magui.py"
or build your own using the included Dockerfile in the git checkout. docker run --user=$(id -u) --rm -v $PATHTOSOSREPORT:/data:Z citellus:latest /data --entrypoint="magui.py"
Docker passes as volume the path specified under /data so we do use that parameter with citellus for running the tests. The default user id within the container is 10001 and the commands or sosreport permissions doesn't allow that user to gather all the information, so the container is required to run as the current user. Plugins for Magui are to be written in Python, check next section for details. --hosts hosts         Gather data via ansible from remote hosts to process. This is an example of execution of Magui against a set of sosreports with seqno plugin of Citellus enabled. #magui.py * -i seqno # (filtering for ‘seqno’ plugins. On this example, UUID and SEQNO is shown for each controller. Magui does check metadata for finding host roles or hostnames that should be checked together and generates additional json files for them. Please do check for more details. Please if you have any idea on any improvements please do not hesitate to open an issue or submit your contributions.